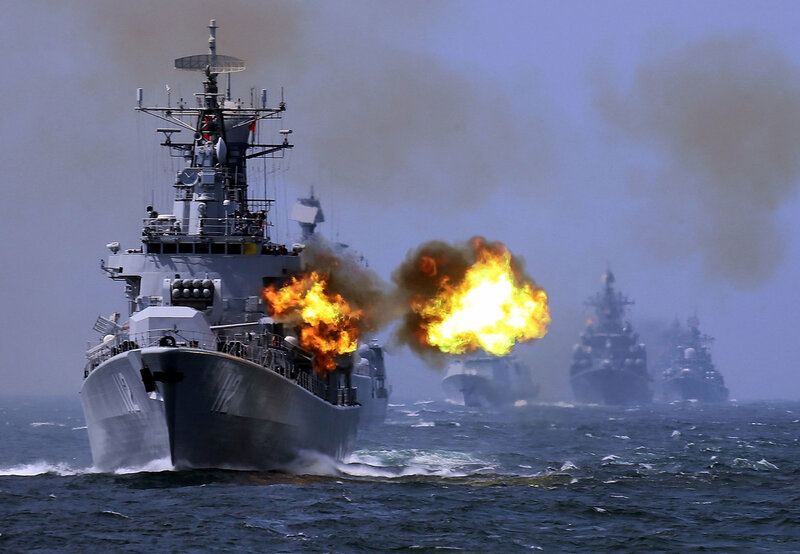 The Chinese military challenged a US destroyer to a South China Sea showdown - 动听曲歌 - 小木猫 - Powered by Discuz! A Chinese destroyer reportedly challenged the destroyer USS Decatur in the South China Sea Sunday as the latter attempted to pass within 12 miles of the Chinese-occupied island. US officials characterized the incident as "unsafe," as the Chinese warship sailed within 45 yards of the US naval vessel. This tense incident comes amid rising tensions between naval powers. These missions, often a thorn in Beijing's side, demonstrate that the US does not recognize China's excessive and previously discredited claims to the South China Sea. The Chinese People's Liberation Army Navy (PLAN) reportedly took on the US Navy in a South China Sea showdown Sunday during a freedom-of-navigation operation involving the USS Decatur. A Chinese Luyang-class destroyer steered within 45 yards of the Arleigh Burke-class destroyer near the Spratly Islands this weekend in a confrontational exchange that US officials deemed "unsafe," CNN first reported. The US Navy ship was forced to maneuver to prevent a collision. The Chinese vessel "approached USS Decatur in an unsafe and unprofessional maneuver in the vicinity of Gaven Reef in the South China Sea," engaging in "a series of increasingly aggressive maneuvers accompanied by warnings for the Decatur to depart," Pacific Fleet said in a statement. "US Navy ships and aircraft operate throughout the Indo-Pacific routinely, including in the South China Sea," the US military explained, adding, "As we have for decades, our forces will continue to fly, sail and operate anywhere international law allows." The incident comes as tensions escalate between Washington and Beijing over a wide range of issues, including, trade, Taiwan, sanctions, and increased American military activity in an area Beijing perceives being its sphere of influence. US Air Force B-52 Stratofortress heavy long-range bombers flewthrough both the East and South China Sea last week. Beijing calledthe flights "provocative" and warned that it would take "necessary measures" to defend its national interests. China conducted "live-fire shooting drills" in the South China Sea over the weekend in a show of force in the contested region. The recent showdown between the Chinese military and a US warship follows a similarly tense incident in the South China Sea involving a British warship. The UK Royal Navy amphibious assault ship HMS Albion challengedChina's excessive claims to the contested waterway by sailing near the Paracel Islands. In response, the Chinese PLAN dispatched a frigate and two helicopters to confront the British ship. The Chinese military has also repeatedly issued warnings to US and other foreign aircraft that venture to close to its territorial holdings in the region, many of which have been armed with anti-ship and surface-to-air missiles, among other weapons systems. China has canceled two high-level security meetings with US defense officials in the past week as tensions between the US and China rise.